Clump #17: Send out Christmas/New Year/MLK Day cards. Apologies to Dr. King for the title of this post, but Thank God Almighty, the card of 2012/13 finally got into the mailbox. In keeping with a series of unfortunate events at every stage, I tried to take a photo of the cards entering the mailbox, but realized the camera battery was charging at home. I tried again with my cell phone, not aware it was set on video. I will not subject you to that scintillating footage! Here is a visual approximation, below, a print I’ve always loved (artist unknown). 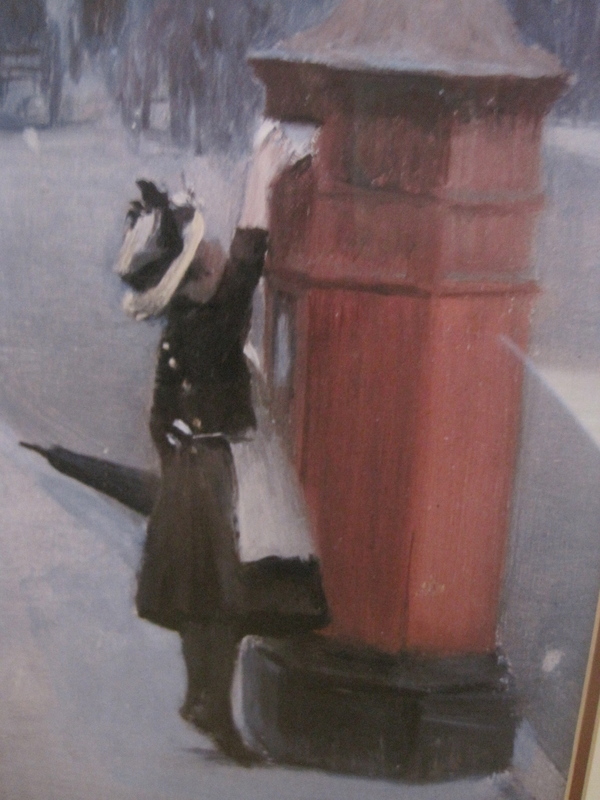 It captures the exhilaration of sending something out into the world. And what a great hat! Even this photo of the photo card is bad. It reads, “Have a SPARKTACULAR 2012! with a fireworks graphic surround. I got it printed at Target, typed our names below the greeting, and completely missed the fact that I was making a wish for last year! Target!! Reformat your machine! To be fair, when the problem was pointed out, Target printed the correct year on a new set of cards without charge. Also, to be fair, this was one of many instances when I had to admit I need to resharpen my editing skills. 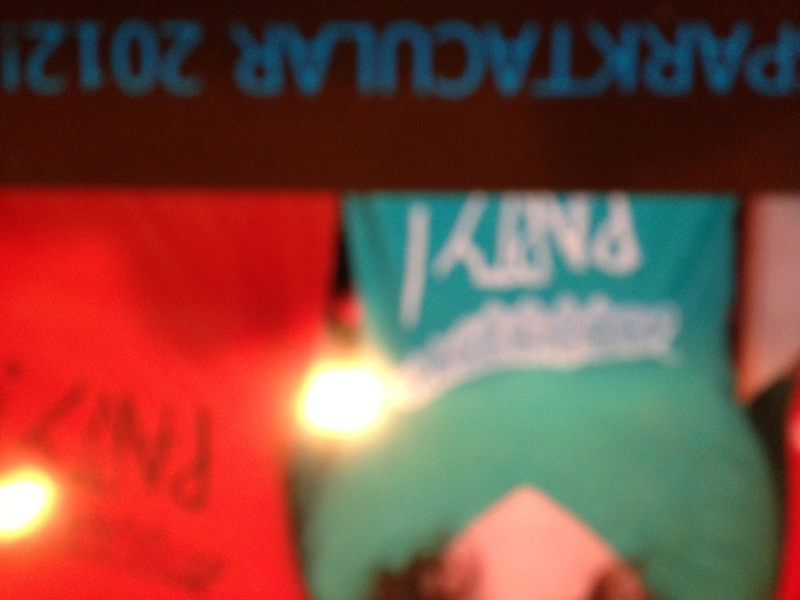 Our kids were in Caterpillar Party (one of my son’s bands) tee shirts. If the tradition of having them together in the same photo continues, we might be sending more New Year cards in the future. Occasions when they are all together have become precious and few. 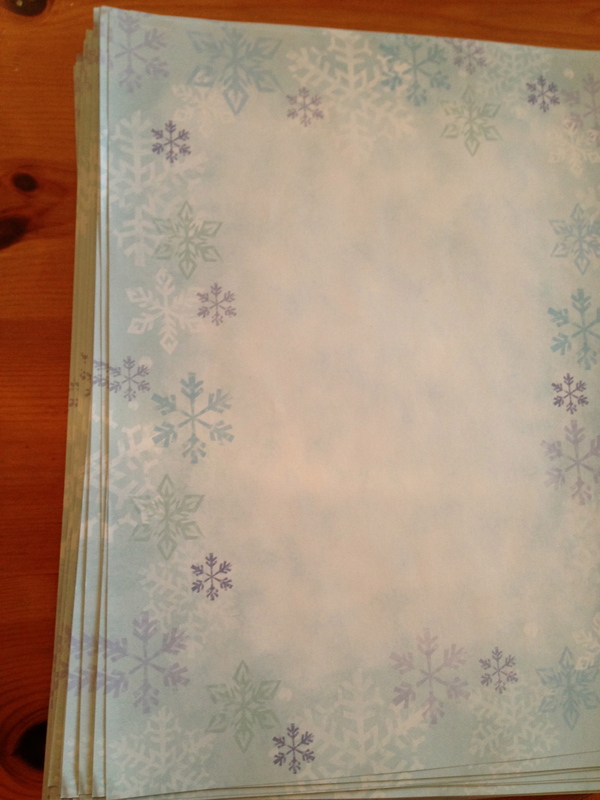 This sweet and innocent-looking paper was an item I pounded the pavement to find at holiday time. The idea was to print the newsletter on the front and a poem written by a dear brother-in-law, who passed away last spring, on the other side, with a photo above it. The photo would not print at Staples; at Kinkos, the paper got stuck in the machine; a photo-copy of the paper, photo-copied, was headache-inducing to read (just as trying to describe it is). I’m really leaving out many other obstacles having to do with group-editing and wrong computer-file type. Blah, blah, blah, boo-hoo. I would have sent out the headache-inducing version of the letter (trying Very hard not to be a perfectionista), but I discovered that in all the reformatting, a portion of the poem had been cut out. D’oh!! Unacceptable. I have a great respect for people who can capture an essence in poetry, which was one benefit of this almost never-ending project (reading and re-reading the poem). Consequently, I was much more open to the beautiful poem written for Inauguration Day by Richard Blanco. “Pencil-yellow school buses…” what an apt connection I had never noticed. Here is the text, if you missed it, or wish to revisit it. The first sentence of our newsletter explained that our Christmas card had turned into a New Year card, and, if we weren’t careful, would be a/an MLK day card. Ha-ha, funny–until it actually was MLK day. Another editing change (to Valentine’s Day). 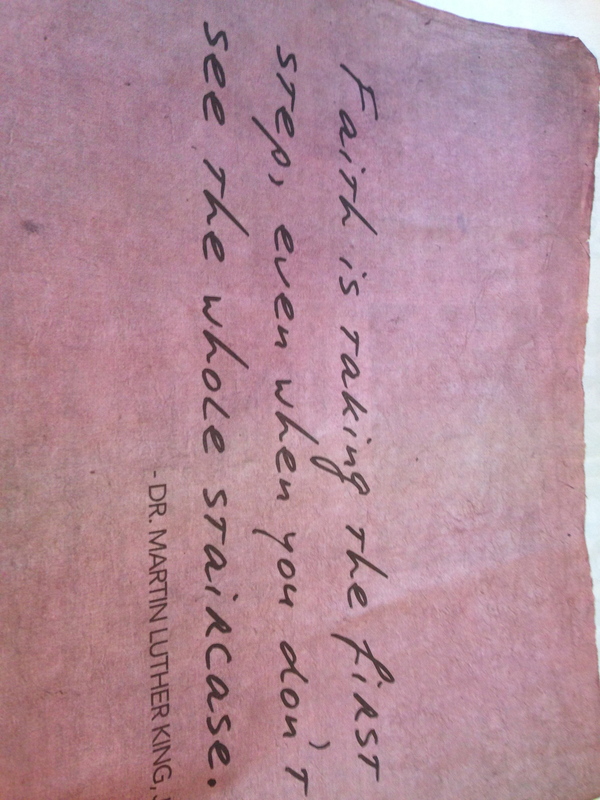 This quote was part of a full-page Macy’s ad on January 21. 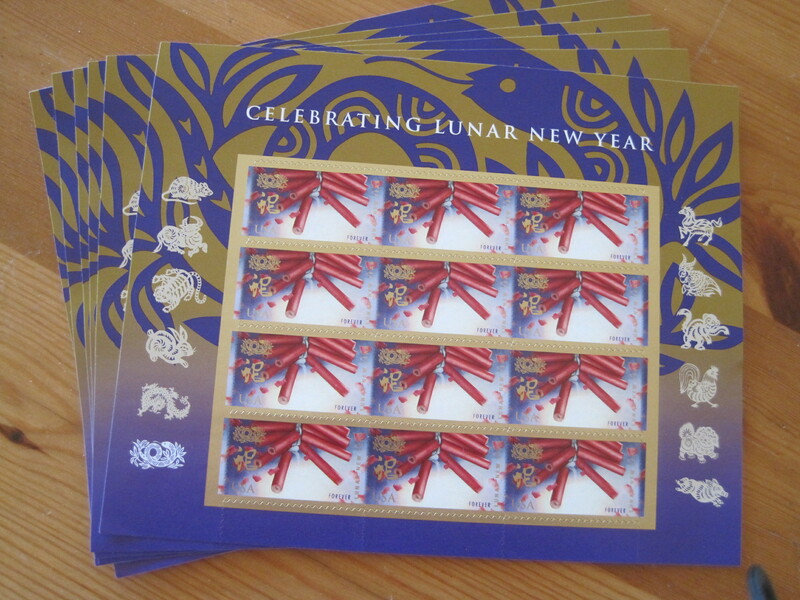 Happily, I noticed these Lunar New Year stamps at the post office. I don’t know (but have been wondering a lot) what the shelf-life for wishing someone a Happy New Year is, but Lunar New Year is not until February 10! It will be the year of the Snake. The fire crackers went with our SPARKTACULAR theme! 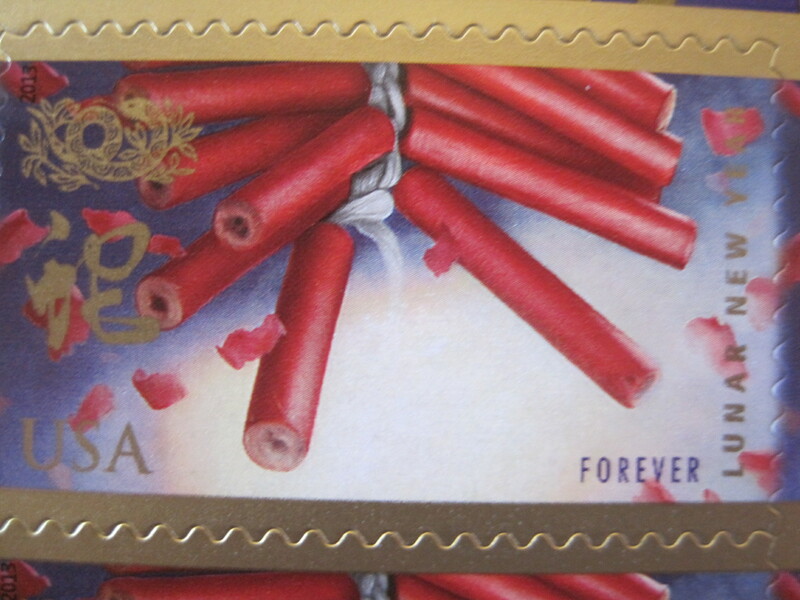 According to the US Postal Service, “Firecrackers such as those depicted in the stamp art are used to scare off evil spirits and welcome this time of renewed hope for the future.” Amen. Here are stamps that weren’t appropriate at this late date, stored in a ceramic container that makes me smile when I think of its origin. Several years ago we were shopping while on vacation at the shore. I scooped this up with a book on Clutter Busting. My husband saw what I was buying and gave me a stern, raised eyebrow look. I hadn’t noticed the irony: oh yeah, how to get rid of clutter, and a piece of clutter to go with it. 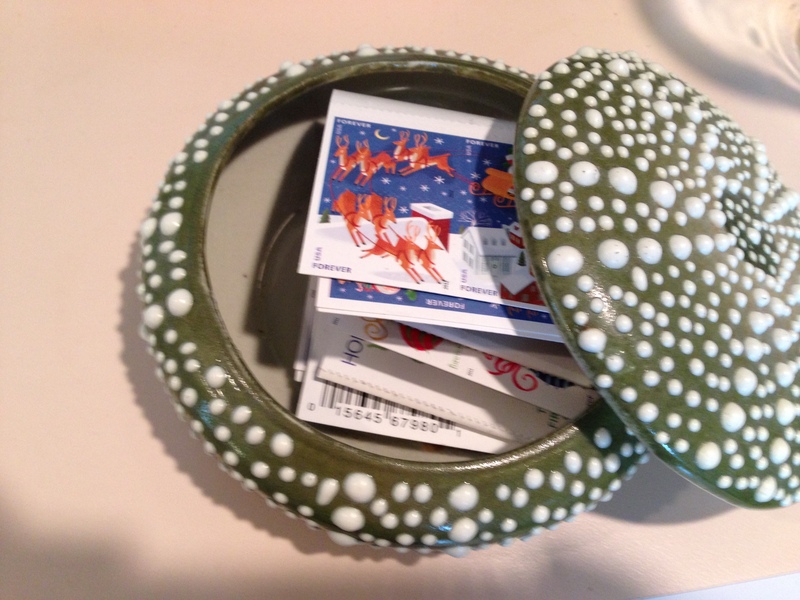 I made the purchase anyway and now the dish is our dedicated stamp place; a sea creature living under the kitchen wall phone. It has saved us from our old fretfully-scouring-around-for-stamps routine. Also, it reminds me of the beach and is a delight to handle (reflexology for the fingers?). Lesson learned: not all pieces of clutter are created equal, unlike people.